Action is a constituent part of a Task directly responsible for (a part of) the job done. No matter whether the Task is executed manually or automatically, it always proceeds with performing the operations specified in its Actions. Actions can perform all kinds of file operations, send emails, run external applications, extract zip files, etc. Task can contain multiple Actions that can talk to each other using Variable Wizard. Every Action not only performs operations specified in its settings, but also can retain data on the context of its execution. The subsequent Actions within the same Task can base their operations already upon the data retrieved some preceding Action (or Trigger responsible for automatic Task execution). The dynamic data exchange between Actions and Actions is made possible by Variable Wizard. Many inputs of Actions support dynamic data (variables) as their configuration parameters. Sequential steps based on simple Actions that communicate among themselves can render advanced and flexible results in multitude of complex environments. Automation Workshop features powerful tools that can substantially reduce human effort by replacing it with automated routines. Secure SSL email · freeware high performance email automation tool. Advanced zip encryption with AES · automated and secure archive processing. 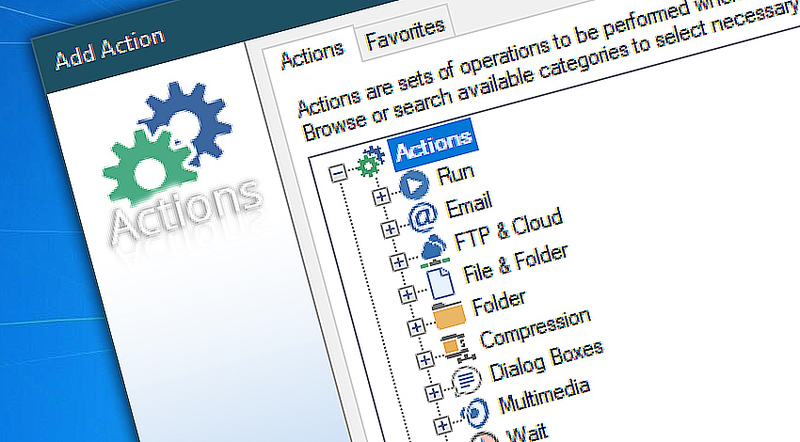 File operations · automatic file copy, rename, delete, read, write and other actions. Automation Workshop Free Edition contains multiple Actions sorted in various categories that can perform a wide range of tasks from file manipulations and email sending to performing scripts and external applications in advanced manner. Run · run external applications and CMD commands as well as scripts and batch files. Email · take care of highly demanding email automation tasks. 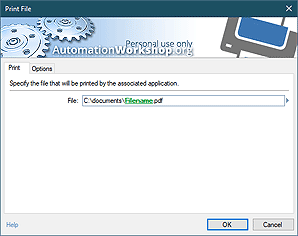 File / Folder · automated file operations both with files and folders. Folder · automate folder creation, copying, moving and other essential operations. Compression · compressing files and extracting archives. Dialog Boxes · provide user interaction amidst automated workflows. Multimedia · playback of media files and system sounds. Wait · pauses the Task until the conditions are met. Printing · send documents to printer. Registry · automate operations with Windows registry. The Logic category adds control options over the workflow by introducing conditional branching, redirection operators and other automation instruments. Also, process and transform the text data and use custom variables to extend data exchange among Actions. Compare · decide which workflow to run by analyzing data. Loop · design loops within a Task to perform a set of Actions for a number of cycles. Flow · redirect workflow when necessary. Text · a powerful toolset for basic to advanced text processing and manipulation. Variable · create custom variables for convenient data transfer among Actions. Comments · leave notes directly in the workflow. Additionally, Workshop category actions allow to automatically manage Tasks and log events in application's service log. Tasks · options for automated Task management. Log · write custom message in Automation Workshop service log. Triggers · activation conditions that continuously monitor the system. Actions · operations that are automatically performed on Task execution. Automation Workshop truly is a solution for my automation needs! It's fantastic! —Donald K.